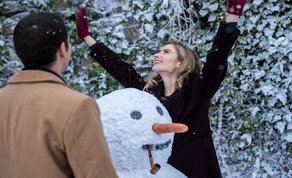 Principal photography wraps on 'Christmas Perfection', after three weeks of shooting across Dublin and Wicklow with Avoca Handweavers serving as the film’s main location. Directed by David Jackson, (‘Miami Vice’; ‘Nash Bridges’; ‘One Tree Hill’; ‘Charmed’) with a strong female team in play, including 'Christmas Perfection' screenplay by Lauren Hynek and Elizabeth Martin (Disney’s new live-action ‘Mulan’ - 2019), and produced by Julie Ryan of MK1 Productions (‘The Young Offenders’). Executive Produced by Margret Huddleston and Jennifer Westin for Mar Vista Entertainment Studios. It’s Groundhog Day meets Christmas Day when Darcy magically wakes up in her perfect Christmas Village in Ireland. Jackson’s feature stars Caitlin Thompson (‘This Is Us’; ‘Crazy, Stupid, Love’), James Henri-Thomas (‘The Windsors’), Robbie Silverman (‘Agents of S.H.I.E.L.D.’) with an energetic ensemble of supporting Irish actors including Norma Sheahan (‘Moone Boy’), Gary Hetzler (‘An Klondike’), Caoilfhionn McDonnell (‘Cherry Tree’), Rachael-Mae Brady (‘Vikings’), and Sinead O’Riordan (‘Dead Along The Way’). The Maguire Family Trad band provide the musical backdrop for the magical world of Christmasland. Federico Rea (Battered Dreams) is the director of photography, with production design by Ferdia Murphy (‘Handsome Devil’; ‘The Stag’), and costume design by Sarah Yeoman (‘The Drummer and The Keeper’; ‘Game of Thrones’). Line produced by Emmet Fleming (‘Kissing Candice’; ‘The Belly of The Whale’), 1st AD Craig Kenny (‘Kissing Candice’; ‘Cardboard Gangsters’) Sound Recordist Paddy Downey (‘Cellar Door’; ‘Dublin Old School’) and edited by Angel Gamboa (‘Off the Rails’). Students from Kerry ETB Training and IADT trained on the production team. Christmas Perfection is slated to be released for Christmas 2018.